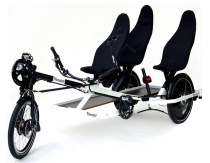 When you consider the advantages a recumbent has over a normal bicycle for your health it is easy to see why many heath professionals from Neurologists to Urologists recommend them. 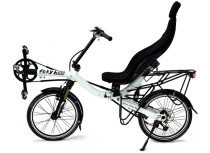 With a comfortable suspension the spine receives no impact when the road is uneven and the pressure on the vertebra are reduced. Shoulders, elbows, wrists, and hands are not always under extreme pressure as with a normal bicycle. Because of lack of pressure on the hands and wrists you no longer have to worry about your “hands falling asleep”. The neck vertebra are not over stretched, relieving tension and preventing any chance of damage. There is no restriction of the stomach and chest organs and important blood vessels as by a road or mountain bike. Because the body is in a horizontal position the heart will not have to work as hard to pump the blood upwards resulting in a lower heart and blood pressure rate. There is a positive effect on the blood flow in the veins because the legs are in an elevated position. With the upper body supported while pedalling not only will the legs get a work out but also the stomach, back, and buttock muscles (the perfect workout program). The Cologne Urologist and doctor of sport medicine Dr. Frank Sommer recommended in his book “VigorRobic” “ Simple exercise help the function of the blood vessels and the flow of oxygen to the genital and buttock. With the combination of endurance training and special exercises the patient can help make himself better. The patient should also do exercises like jogging, knee bends, or leg presses. 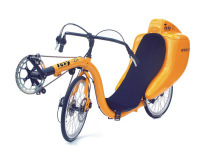 When it comes to bike riding men should ride a recumbent instead of a normal bicycle in order not to restrict the blood vessels.